Tired of cranking your boat out of the water? 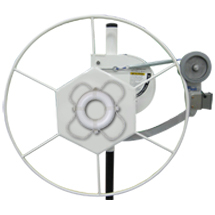 This friction wheel-drive motor is a simple way to take the effort our of raising your boat. Increased speed and strength over competing brands lift your boat out of the water with confidence, yet gives you the feeling of comfort to use the wheel whenever necessary or in the event of power failures or a dead battery. AC & DC models available to suit everyone’s needs! Don’t let the thought of cranking your boat up deter your from your next ride on the water! WARNING: Studies show that adding a motor o your boat lift dramatically increases the amount of boating you will do. Once you add power you will never go back! Lake Lite has Teamed up with Lift Tech Marine to offer the finest lift motors on the market. Fits all current lift applications with a 21st century approach. Lift Tech Marine puts forth an unbeatable combination of leading-edge technology and industry experience. The results show in our new mounting system.